The first Xbox One games announced includes FIFA 14, Madden NFL, NBA Live and UFC from EA Sports, it was revealed at Microsoft's new Xbox reveal event today. Xbox One will also see a game from Max Payne developer Remedy called Quantum Break. Finally, Microsoft Game Studios' hallmark racing series will be coming to the new system in the form of Forza Motorsport 5. The engine powering these game titles is EA's new engine Ignite, it announced today, that delivers a broad array of rendering capabilities, run-time physics, animation, intelligence, locomotion and integrated online systems. There are a total of 15 exclusive Xbox One games in development, according to Microsoft, including eight brand new franchises. Better yet, there will be exclusive features in some of the launch games for Xbox One. This includes an Ultimate Team for FIFA 14, which EA Sports boasted is exclusive to Xbox One. 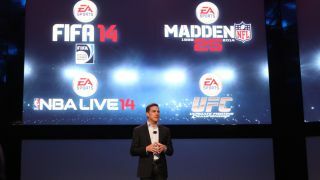 EA Sports also announced that these sports titles will include 3D crowds, dynamic sidelines and a daily stream of content. EA Sports promised more details about FIFA 14 Ultimate Team mode later this year, which likely means an E3 announcement along with further Quantum Break and Forza Motorsport 5 news.